“Grrrrr.” Stoically holding back the memories of Dali’s opinion of J M W Turner (1775-1851) which we largely share, and of many of Mr Leigh’s previous films (a herd of head-in-oven slices of domestic life), The Varnished Culture settled down to see this handsome period piece on the famous British proto-impressionist. To our disadvantage, we had failed to recall the usual outcome of painterly biographies – more agony than ecstasy. 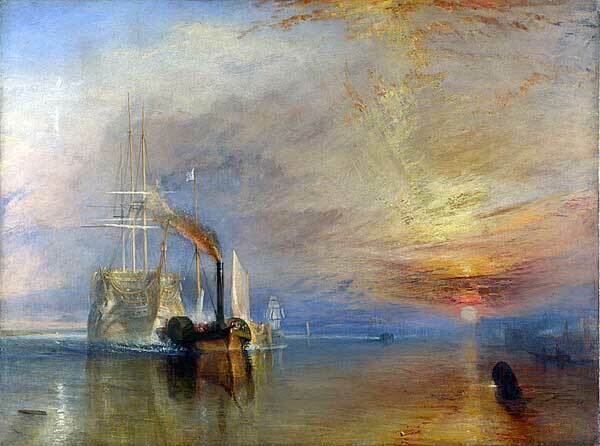 It doesn’t look bad – lots of lovely brown and gold set pieces, a la Peter Greenaway, and a terrific re-creation of the Fighting Temeraire tugged to its last berth to be broken up, but as a film it plays like many of Mr Turner’s unsatisfactory pastiches – over-daubed, ill-formed, smudged. Unedifying scenes of old folks going in and out of rooms predominate. It’s merely a badly-constructed series of vignettes with the type of audience-exposition dialogue that went out of fashion in the 1950s: “Good day, Mr. Constable.” “You’re a man of great vision, Mr. Turner.” John Ruskin (here played as lisping loon) pops up to give us a tutorial on JMW’s genius, while the genius sits silent, humble and not demurring. 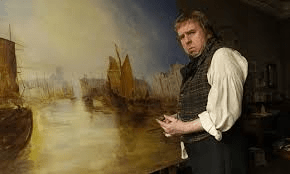 Mr Turner (sometimes ‘William’, sometimes ‘Mr Mallord’) as rendered by Timothy Spall, trudges around, spits and grunts (“Grrrrrr!) but in a kindly, knowing manner, like Dr Zaius in Planet of the Apes. Gruff and phlegmatic, he is an uncertain insider, as comfortable at the Royal Academy as Beethoven in a brothel, or T.S. Eliot on Margate Sands. But all we get is a pot of paint thrown in our face. 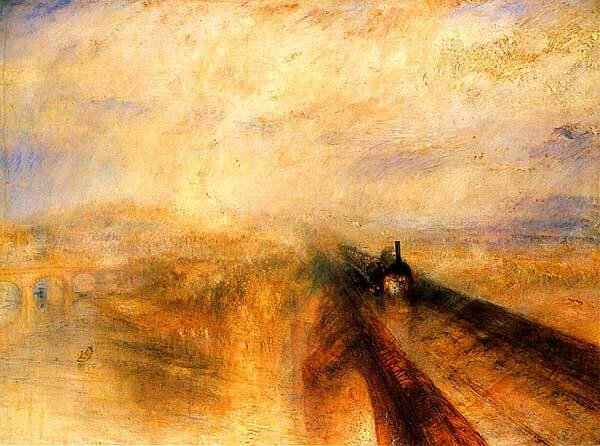 We don’t get any sense of Turner’s drives, desires, or the reasons for and context of his talent.